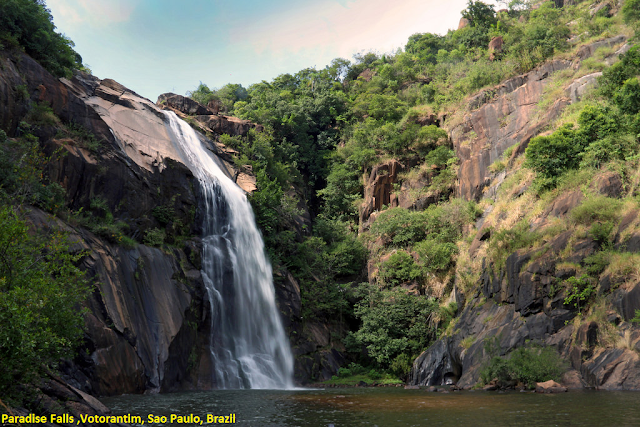 The Cachoeira Paradise is located in the Sorocaba River Valley,this majestic waterfall occurs in a wall of about 45m vertical, forming at its base a huge natural pool of calm water and with a maximum depth of about 2m. Part of the bank of the lake consists of a bank of sand and pebbles that forms a river beach. In the center, there is another sandbar that literally forms a small island! The Sorocaba River is of extreme importance because it supplies the dam of Itupararanga, the vegetation in the place is similar to that of the Cerrado due to the amount of Limestone. Votorantim is considered one of the greatest powers in the economic scenario of industries derived from "cement" masses. Incredible waterfall. You will meet a people from Votorantim who made this trail more than 20 years ago and it is advised you to leave the car in the parking lot so as not to risk being squeaked. The hike along the trail takes over 1 hour to the waterfall, there are several obstacles like rocks, ravines, thorns and rock climbs, but in the end everything will worth it. The view is crazy, you find other lakes nearby and the landscape is worthy of another planet.